Rainforests and swampy areas. They are found in the Wet Tropics of Queensland, which is a World Heritage Area. Cassowaries are one of the largest birds in the world at up to five feet tall and weighing in at around 130 pounds. Their heads and necks are a colorful blue with red wattles hanging below their beak. On top of their head is a brown, bony casque that looks similar to a large horn. Cassowaries are covered in stringy black feathers that are often mistaken for hair. Their long scaly legs have formidable feet at the end – one of their claws is six inches long, dagger-like, and can be used as a weapon. In the wild Cassowaries live around 30 years, and in captivity they can live 40 to 50. In the wild, Cassowaries eat mostly fruit, with the occasional small animal or insects. At the zoo he is fed a fruit and vegetable mix with pellets called Mazuri Ratite Diet, as well as grapes for a treat. Cassowaries are solitary except for breeding, and when it’s time to have chicks, it’s all up to the male! Female cassowaries will lay their eggs in a nest made by the male, then will leave the male to incubate the eggs and raise the chicks. Chicks will be raised and protected by their father until they are around 9 months old. Vulnerable. In Australia, they are threatened mostly by habitat loss and habitat fragmentation. In New Guinea, they are threatened by hunting, especially as a food source. Next to the Sea Lion area. 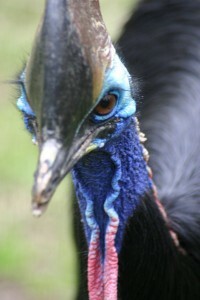 The Zoo has one cassowary, a male named Emil. Emil was born on August 21, 1991. Emil is one of the only cassowaries in the United States trained to do blood draws and step on a scale. He has a specially designed “squeeze” crate which is a small holding area he is trained to get into. Keepers can feed him grapes through a window and draw blood from underneath his wing. They are also known as the Southern Cassowary. The Cassowary is the most dangerous bird in the world, and one of the most dangerous animals at the Birmingham Zoo (just like a lion or a tiger). Make sure to respect their space! Cassowaries have many different vocalizations, and the most notable is a low, guttural booming sound. The bony casque on top of their head is used to move vegetation out of the way as they move through the rainforest. It is not used for defense, as they use their claws for this.